The Steinbach mass may be associated with an observed fall of either 1164 or circa 1545, but the records are not adequate to establish a clear date of fall. With approximately equal mass of Fe-Ni metal and silicates (i.e., ~ 70 vol% silicate) Steinbach has long been characterized as a 'stony-iron'. 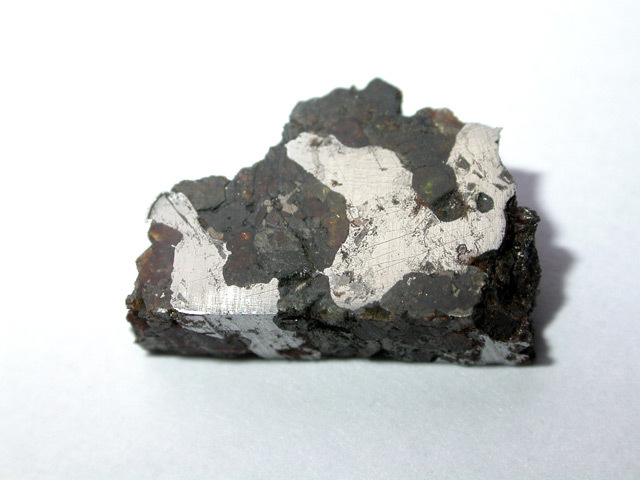 However, as the composition of the Fe-Ni metal is that of a IVA iron the meteorite is now formally classified as a IVA iron with silicate inclusions. 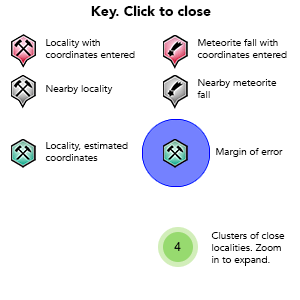 The mineralogy includes the primary expected phases for an iron meteorite (kamacite, taenite, schreibersite, and troilite), minor oxides and sulfides often found in reduced stony and iron meteorites, and an unusual silicate assemblage consisting of tridymite and at least two mildly variable, magnesian pyroxenes (Fs14-20; Wo≤1). Steinbach was the first recovered and the 11th most massive of the 79 IVA irons which have been listed with the Meteoritical Bulletin Data base [early 2015]. In addition to its silicate inclusions, its Fe-Ni metal is also somewhat unusual and is one of only 6 'anomalous' IVA irons. Reference: Ramdohr, P. (1973) The Opaque Minerals in Stony Meteorites. Elsevier Publishing Company: Amsterdam; London: New York. 245 pages. Reference: Ramdohr, P. (1973) The Opaque Minerals in Stony Meteorites. Elsevier Publishing Company: Amsterdam; London: New York. 245 pages. ; Reid, A. M., Williams, R. J. & Takeda, H. (1973) Coexisting bronzite and clinobronzite in the Steinbach meteorite. Meteoritics 8: page 66. Prior, G. T. (1923) Catalogue of Meteorites: with special reference to those represented in the collection of the British Museum of Natural History. Richard Clay & Sons, Limited: Bungay, Suffolk. Reid, A. M., Williams, R. J. & Takeda, H. (1973) Coexisting bronzite and clinobronzite in the Steinbach meteorite. Meteoritics 8: page 66. Ulff-Moller, F., Kallemeyn, G. W. & Rasmussen, K. L. (1992) The IVA Parent Body: Evidence from Silicate-Bearing Group IVA Iron Meteorites: Meteoritics 27(3): p. 301. Grady, M. M. (2000). Catalogue of Meteorites (5/e). Cambridge University Press: Cambridge; New York; Oakleigh; Madrid; Cape Town. 689 pages.